It may have been a clever internet ruse more than anything, but a few weeks ago, a series of Spaceballs 2 posters were photographed in New York and shared across the web. Chatter soon went wild about Mel Brooks’ possible return to his brilliant 1987 spoof Spaceballs, a film that gave rise to decades of memes, quotes and, reportedly, higher Winnebago sales. Several of the original film’s stars have said they’d be up a sequel, but just in case Mr. Brooks is still undecided, here’s our 10 Reasons We Need a New Spaceballs to add to the cause. When George Lucas’ Star Wars prequels were released, Mel Brooks may well have been overcome with possible Spaceballs 2 fodder. Jar Jar. Midichlorians. Hayden Christensen. Brooks would have had a field day. That’s not to say the director still couldn’t look back at the prequels for spoofing, but it’s arguable that others have already done a great job at it, such as Robot Chicken. Which means Brooks could now easily focus on The Force Awakens for direct parodying - we would love to see what he would do with everyone's favorite dancing stormtrooper. When sound chameleon and comedian Michael Winslow appeared on screen in Spaceballs as a radar technician, he’d lost the bleeps, the sweeps and the creeps. And despite some of the funniest Winslow action in all of the Police Academy films, audiences somewhat lost sight of the master voice-man since the early 90s. For those of you too young to remember, Winslow could make any number of realistic sounds using his voice, including the kinds of blips and bleaps you hear in Star Wars. That’s why he needs to come back for Spaceballs 2. No one else can do what Winslow does. In fact, the whole sequel could just be Winslow beat-boxing and making radar and spaceship noises using only his mouth, and the film would probably be a success: Spaceballs 2: Revenge of the Radar Technician. Done. Perhaps that’s not quite true. The Naked Gun was pretty darn good. And Hot Shots!, well, that was kinda funny. Those Scary Movie films did well. And the Austin Powers flicks really hit the nail on the head. But, you know, apart from all those films, and probably a bunch more, there hasn’t been a good spoof film since Spaceballs. Yet another great reason for the sequel to bring parody back to the fore. To be honest, Mel Brooks could use one more great film as well. His movies kind of petered out in the '90s with some lackluster outings (Dracula: Dead and Loving It anyone? ), so one more Spaceballs could be what he needs, rather than yet another Broadway adaptation of his classics. Dark Helmet: Before you die there is something you should know about us, Lone Star. Lone Starr: What? Dark Helmet: I am your father's brother's nephew's cousin's former roommate. Lone Starr: What's that make us? Dark Helmet: Absolutely nothing! Which is what you are about to become. Yogurt: Who knows? God willing, we'll all meet again in "Spaceballs 2: The Search for More Money." "My brains are going into my feet!’" screams Dark Helmet as he takes the crew of Spaceball 1 into "Ludicrous Speed," a hyperspace pace that seems to know no bounds, except for the trail of plaid it leaves in its wake. The joke is, of course, a reference to the hyper speed of Star Wars, in which the bright dots that make up the stars turn into long white lines as the Millennium Falcon approaches speeds we can't conceive of. In Ludicrous Speed, they somehow turn into a Canadian tailor's favorite pattern. Seeing as most sequels tend to take things up a notch, what bigger and better speed might Spaceballs 2 offer? Checkers? Polka dots? Paisley? And remember, Ridiculous speed is already taken. For a while there, Rick Moranis seemed like an unstoppable force in movie comedies. He almost stole the show in Ghostbusters, definitely stole it in Spaceballs, and then captivated audiences as the inventor dad in Honey, I Shrunk the Kids. After his wife Ann passed away in 1991, however, Moranis reduced his acting commitments to raise his kids. He hasn't been in a movie since 1997, although he's done voice work as a Canadian moose on Disney's Brother Bear and its sequel, riffing on his SCTV character Bob McKenzie. But if there was one character Spaceballs 2 almost couldn’t do without, that would have to be Moranis’ Dark Helmet. Who else could deliver the line, ‘So, Lone Star, now you see that evil will always triumph because good is dumb,’ like Rick Moranis. Note to Spaceballs 2 writer: if you’re looking to add a few new characters to the mix, consider the vengeful son of Pizza the Hutt, who could be angry at Lone Starr for not paying off a debt to his gangster father and leaving Hutt Sr. to eat himself alive. Or that could be the plot of film three, whatever you like. We'll let you have the idea, though we'll expect a royalty check in the mail. In any case, Pizza the Hutt was one of Spaceball’s most memorable and, it seems, delicious characters. So it makes sense to bring back the spirit of Mr. Hutt, although maybe this time we’ll see a reference to the modern wave of franchises in the form of Subway or Chipotle. Spaceballs showed us that in 1987 there was a new breakthrough in home video entertainment with "Instant Cassettes" - video tapes of your favorite movies available before the movie was even finished (and before it was out at the cinemas, of course). So incredible were these cassettes that Dark Helmet managed to use them to find out where Lone Starr and Princess Vespa were hiding, simply by fast forwarding. But did Instant Cassettes make it through the video wars? Surely they would have triumphed over both VHS and Beta. Imagine what would be possible now with Instant Blu-ray and Instant streaming video. Instant Cassettes might have been cool in the '80s, but they surely would have trouble competing with Netflix. We really are at now, now. 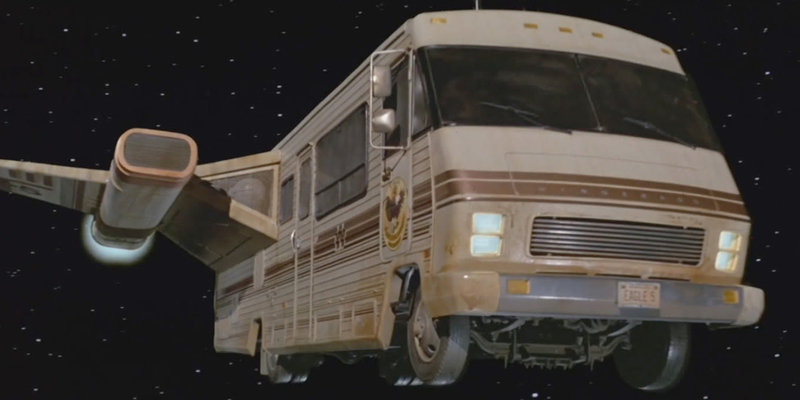 Spaceballs had arguably the best use of a Winnebago - Starr and Barf’s spaceship, the Eagle 5 - on a movie or TV show. But since then, Winnebagos have failed to impress on our screens (let’s not even mention the Robin William’s starrer, RV). That was until Breaking Bad made Winnebagos all sorts of awesome again. Not that we’d want to see the guys in a new Winnebago or anything. Just like the Millennium Falcon in The Force Awakens, Spaceballs 2 better have the original Eagle 5, complete with kitchenette, "Mawg’s Room" and top secret hyperjets. Sometimes the original is still the best. Spoofing the abundance - and success - of Star Wars merchandise was a key aspect of Spaceballs. Even the wise and powerful Yogurt showcases his wares with Spaceballs: The T-shirt, Spaceballs: the Coloring Book, Spaceballs: The Lunch Box and Spaceballs: the Breakfast Cereal. And we could expect more from the sequel, likely to be even more preposterous. Spaceballs: the Flame Thrower, anyone? Oh, that was already in the first one. Well, it is where the real money from the movie is made. Just look at the madness of last year's #ForceFriday. If Spaceballs 2, a purely hypothetical movie that will probably never exist, is to survive in the modern climate of blockbuster movie releases, it's gonna need to sell a lot of toys. Can you think of any other reasons we need to see a sequel to Spaceballs? Let us know in the comments!